Jvari Monastery is one of the oldest churches in Georgia. History of this complex begins in the 4th century when Christianity became the main religion of Georgia. Place where Jvari Monastery is located had been a place of worship of pagans. 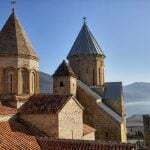 Idols stood tall overlooking the city of Mtskheta and remind everyone of their pagan believes. This changed with the conversion to Christianity. King Mirian and Saint Nino destroyed pagan idols and erected a cross in their place. It quickly became the main place of worship not only for Georgians but also recently Christian northern Caucasian tribes. Cross erected here was made from the miraculous tree from Mtskheta (See the story of Svetitskhoveli) and was considered to have healing qualities. People came from distant places to touch the cross and heal their disease. The church that stands here now is from the 6th century. It covered the Cross in order to preserve it from deterioration. Jvari Monastery gets its name from the cross – In Georgian “Jvari” means a cross.